Acquiring a new horse is a large investment, in time, money and emotion. Whether this is your very first horse, an investment opportunity or your next partner, it’s good to get a baseline understanding of what you may be getting into before you jump in head first. It’s not uncommon to meet a horse and be in love in a matter of hours or minutes. It’s important to keep a rational train of thought when looking to buy a horse. When possible it’s best to take a horse on a trial period. A trial will give you the opportunity to see the horse for multiple days and interact with them both on the ground and under saddle. If you’re working with a trainer it’s also important for them to be involved in the process. You may find out during the trial that this is not the horse for you and you can continue on your search. But what if this horse seems to be perfect and just what you’ve been looking for? Now is the time for you to make the crucial decision on whether or not to pursue a prepurchase exam performed by a veterinarian. 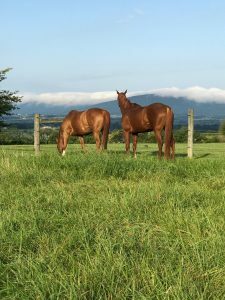 Regardless of the amount of money you are spending on the horse, it’s a good idea to do what you can to limit your risk of acquiring a horse with health, behavioral or soundness issues. There is no guarantee, even with a prepurchase exam, as the exam is a snapshot at a specific time of that horse. A thorough exam can however bring out problems that were not noticed earlier or help justify your investment in the horse. This is why a trial period can be so helpful before the actual examination. The examination will include both a static and dynamic exam. The static exam is typically done first. The horse is looked over at rest; lungs, heart and gastrointestinal tract are ausculted, limbs and back are palpated, the eyes are looked at, abdomen is checked for incisional scaring, jugulars are examined, teeth are looked at, and a cranial nerve exam is performed. Blood is often drawn to be held in case the buyer wants a drug screen or any other lab work completed before purchase. The horse is put under a figurative microscope. The entire time the horse is being looked at its temperament is also being assessed. Once the thorough physical exam is completed, the dynamic exam begins. The horse is observed in motion in hand at the walk and trot. Flexions are done on all joints assessing soundness. The horse is watched in straight lines and on circles in hand or on lunge line. Depending on what is found, the horse may be jogged on different footing or observed under saddle as well. A brief neurologic exam is then done, asking the horse to back up and turn tightly as well as walk up and down a hill if at all possible. During this entire process the prospective buyer is included in the findings and any other concerns that come up can be addressed. The exam typically lasts between 1 and 3 hours in total. After completion of both the static and dynamic exams, the veterinarian and buyer will discuss whether or not radiographs should be taken to look at the joints further, or other diagnostics such as ultrasound or endoscopy are warranted. The veterinarian will discuss with the potential buyer the findings during the exam as well as the suitability of the particular horse for the intended job it is to perform. At this point the buyer is armed with a great deal of knowledge about the horse and can hopefully make a well informed decision. There is no passing or failing a prepurchase exam. Horses are living animals and you will be hard pressed to find one that is flawless. The goal is to find out what flaws the horse has and determine if you can work with those flaws according to your particular goals for the horse. It’s our job as veterinarians to help you determine the level of risk in your potential investment, and it’s our goal to match you with the perfect partner you’ve been looking for.